Occasionally in my grad school, a professor requires a handout as one of the course assignments. Typically the handout is done as an accompaniment to a research paper or presentation that can be shared with other students in the course. I think making short handouts at the end of a research project is very helpful. The process of reducing a 10 page research paper with 15 sources down to a one page handout requires processing and refining the information in a way that helps me make more connections. As I identify the core nuts and bolts of my thesis and support I’m able to refine and digest the research I spent weeks wading through. 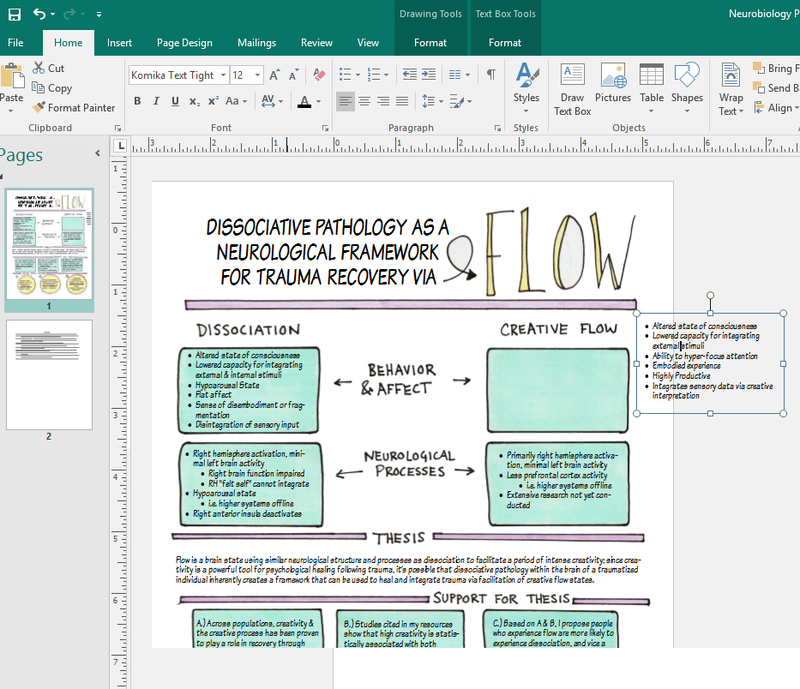 For visual thinkers like me, the extra step of creating a handout is an opportunity to convert a mass of information into a visual a format which can more easily be remembered. Presenting your handout in a visual rich format also helps the reader- the reader will likely spend just a few minutes processing information you spent weeks researching. Whether you are a student or a professional researcher, communicating effectively to this audience requires a little bit of creativity to help them identify your thesis, support, and key points in a format that is engaging and makes sense. This article is divided into two parts: Part 1: How to locate your important information visually, and Part 2: Practical tips on how to blend text and doodles with a professional but engaging layout. Whether you are student, teacher, or professional researcher, it can be tempting to prepare your handout by simply summarizing or outlining your prior written work. Unfortunately this does not usually translate into an easily readable format- and if your handout is difficult to read it’s unlikely it will be read completely and understood by others. For students, this matters for grades, but for teachers, researchers, or professionals the stakes may be much higher- engaging our audience and communicating well is vital for good learning outcomes, grants, and future promotions at work. 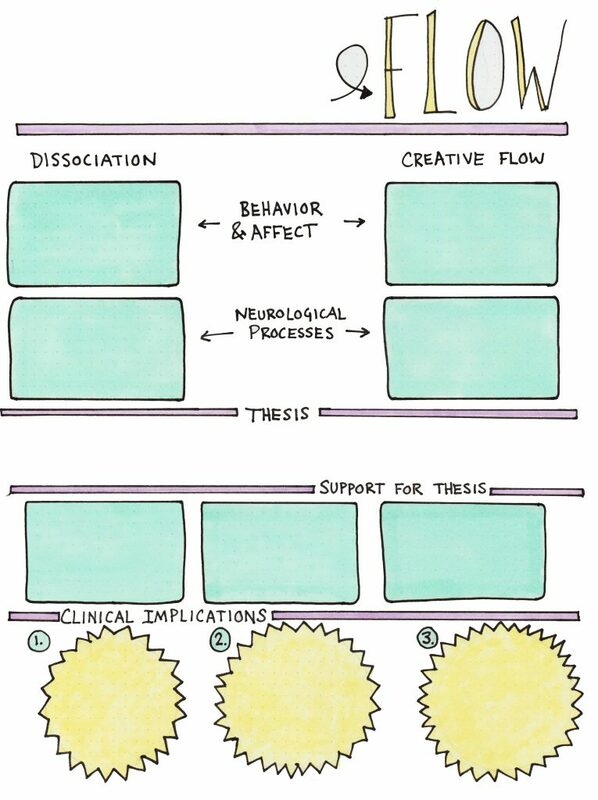 Translating your research into a visual structure is vital. You may discover your own method for translation, but I use mind mapping to locate the key points. Often I’ve drafted my paper as a mind map, but often change course and adapt to finding mid-way through the paper, so to create a handout I go back through my paper and mind map my actual paper. What points support my thesis? How is my information in relationship to other information? Where are these points interconnected? As I ask and answer these questions, a messy mind map usually forms and out of that map a general structure I can carry into Step 2 of my handout creation process. Turning your visual representation of data into an engaging handout just requires a few more steps. 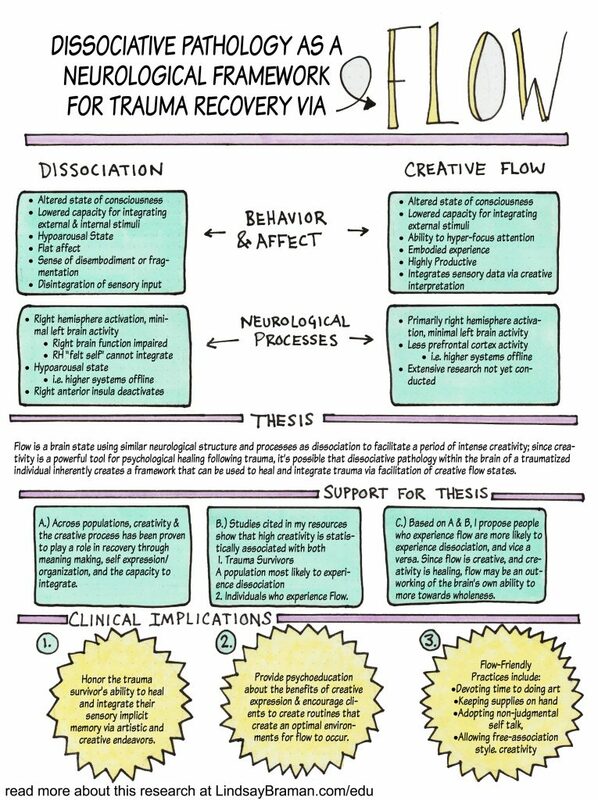 I’ll demonstrate by using the example of a handout I prepared based on this grad school research paper exploring the relationship between creative flow and pathological dissociation. In my opinion, it creates a more polished product if only the background, not the text is created by hand. Digital fonts create a more readable final product, no matter how clear your penmanship is, but the background doodles help illustrate for the reader what is important and why. But it doesn’t look like the image above when I first scan the page I’ve completed. Taking my page from hand-drawn to digital ready takes a bit of editing. In the photo below, I demonstrate (with another hand drawn handout) how I use Photoshop’s curves feature to clear my background and bring my black lines up to a high contrast true black. If you don’t have Photoshop you can probably achieve the same results with alternative software, you’ll just need to play around a bit with brightness, contrast, and exposure. tweaking the curves in Photoshop helps erase all background and bring pen lines into sharp contrast. Once the background is truly white, and my lines and fill are solid and to my liking (I sometimes tweak color using color balance, at this point) I save the image as a jpeg. I continue adding text boxes until my handout is populated and completed, as shown below. Keeping the text digital and design hand-drawn helps the final product look visually interesting and still professional.